Cold Weather Photography Clothing and Outdoor Gear. Snowshoeing on snow machine trail on Kennicott River, winter, McCarthy, Wrangell – St. Elias National Park and Preserve, Alaska. Click on the image above to view a larger version of this photo. The cold in Alaska, in the winter, is incredible. Its stillness, its silence, its depth, and the intimacy of really feeling alone in the frozen north woods is an experience like no other. it’s It’s almost as if the cold is some thing, some being itself, a tangible reality rather than a temperature. It’s a unique experience, and it’s not at all entirely bad – in fact, I love it. But I don’t love freezing my tail off. My friend Patrick Endres, longtime Alaska resident and a fantastic photographer says it best, “I like being in the cold, but I don’t like being cold”. It’s really an extraordinary experience, and I do look forward to the winter. But I don’t want to be cold; I want to be bundled up and cozy, and enjoy the cold from inside my insulation. Photography in the cold is a tough gig; snowshoeing or skiing is rough when the mercury falls beneath minus 20, but doesn’t come close to trying to photograph in similar conditions, in my opinion. I haven’t found any activity that compares to photography; standing around, not moving much, trying to operate fiddly, frozen camera controls and tripods with fingers that refuse to move. I’ve crosscountry skied 10 miles and more at 45below, and I’ll take that any day over futzing with my camera at 30 below. When those mitts come off and my fingertips touch frozen metal, it burns like, well, like I don’t like it at all. So, if you’re headed to Alaska for some winter photography, such as for the Iditarod or to photograph the aurora borealis, hopefully this page might provide you some use. Your winter clothing should align with the Three L’s: “Loft, Loose, and Lots” of it. That’s the key to warmth here. Big puffy down jackets, loose, not tight fit, and lots of clothes, head to toe = warm. Don’t skimp. A good basic rule for cold weather clothing (and I mean, crazy, Alaska-winter cold, not 45 degrees F chilly) is a simple one; looser fits = better. Tighter fits, especially with footwear and handwear, are colder = NOT better. So keep that in mind when you order your boots, socks and gloves. I love my LoweAlpine Mountain Cap. It’s the single oldest piece of outdoor clothing I own, and I wear it every backpacking trip I make, and in almost all cold weather situations. It’s awesome. Other options are a wool beanie, which I have way too many of. The warmest one you can find is the one to start with. I like them too, but my Mountain Cap is #1. I have a couple of those cheap fleece (or wool works too) neck gaiters. Just simple fleece, nothing fancy, but I love ’em. Winter is not the same without my turtle. Definitely requisite. For non-backpacking winter wear, I love my Ibex wool baselayer; I forget the exact model. It’s heavier than I’d want for a backcountry trip, but it’s warm and comfortable. Very warm. I also have wool baselayer tops by Smart Wool and Patagonia, and they’re great. I also have various polypro tops, and a Patagonia Capilene top – the newer (i.e., post-2010) capilene material seems a vast improvement over the older version. For a cold weather photography, anything similar to these should be fine. I also have a Patagonia R1 Flash pullover; great piece of gear, I have both a jacket and a pullover. I live in those things. But wool is my ‘go to’ layer if weight isn’t an issue. I like the feel of it more. Note; some folks will say not to wear cotton here; but I don’t think it’s a big issue if you’re not moving around (and sweating). Cotton is OK if you’re NOT hiking around. If you’re hiking up and over yonder mountain, avoid cotton like it’s death itself. In fact, it just might be death if you have to be mobile. Over that I’ll just add a flannel shirt, wool or cotton, or whatever I have laying around. I might wear the Patagonia R1 flash jacket, which I love; it’s light, wonderfully comfortable, and durable (so far, anyway). But it doesn’t have to be anything fancy; it could be a cheap, warm wool flannel shirt. Then I go for a fat, puffy down jacket – what you want is loft, and lots of it. The puffier the better. Puffier still is even better. For supercold I have a Mountain Hardwear Chillwave, which I’m very happy with. I have a couple of other lightweight Montbell down jackets (the Ex Light and the UL Tec jacket) which I highly recommend, but these aren’t full-on winter jackets; more like 3/4 season backcountry jackets. But I’d recommend their winter wear in a second. Definitely a “parka”, with an insulated hood, is the best cold weather option, rather than a hoodless jacket. Dressed for cold, winter night photography, Alaska. If it’s windy, I’ll add a shell. I have an embarrassingly high number of shells (and just bought one more), so I won’t bore you with details. But any windproof shell is a good choice; a waterproof one isn’t requisite at minus 20degrees, but certainly will be nice. Shells by Arcteryx, Marmot, Mountain Hardwear, etc are all nice. But my regular winter go to shell (it’s not waterproof at all) is an older Nike ‘stormfit’ jacket (left). It’s 15 years old and totally rocks. No longer waterproof at all, but warmer than warm, and pretty robust. I have a few different pair of long underwear, both wool and synthetic (both fleece and Patagonia’s Capilene) to choose from; all of them are fine for winter frontcountry wear. The warmer the better, so I go with my Capilene 4 longjohns and an old pair of North Face 200 weight fleece pants over that. You could even go with a pair of synthetic or down fill puffy pants, like Mountain Hardwear’s Compressor, or Western Mountaineering’s Flash pants. A windproof soft-shell or rain pant works fine over that. Another great option for your shell layer is a simple insulated ski bib. The North Face Anchor Bib is ideal. The best socks I know are my Patagonia Heavyweight Mountaineering socks; super warm, and they don’t get all floppy with wear like the Smart Wool expeditions one do. They wear well. Remember, not too small. For winter boots, I have a pair of Columbia winter hiking boots, and they’re fine if I’m hiking, or snowshoeing, in most conditions. I also have a pair of Sorrel Caribou boots for my ‘when I’m not moving around so much’ photography. And they’re not really warm enough. A pair of Bunny Boots is probably the way to go, or extra big pac boots like Sorrel’s Intrepid Explorer or Baffin’s Endurance Boot. As you can see below, I need to get me some. Barefeet are NOT recommended in snow. Your choice depends on conditions and what you’ll be doing. The critical factor is to NOT buy some snug, well-fitted boot .. you want a looser than usual fit; you’re not backpacking in them, you’re mostly standing around, shuffling your feet in the cold, waiting to shoot something. Give your toes and your socks room to breathe, and your feet will be much warmer. You’ll want boots with a removable liner, so you can easily dry it out when are done in the cold and head back inside. 2 pairs of liners are handy; one to hang by the fire and warm while you wear the others. Swap them out at night. An extra foam or felt innersole can be great, too. The more insulation between your feet and the fiendish cold, the happier you’ll be. Remember .. buy large, not too tight. And yes, that’s me, barefoot in the snow, at minus 20deg F, Wrangell – St. Elias National Park, Alaska. The things we do for a photo, eh? For gloves I have a pair of Black Diamond Guide gloves, which are about as good as any I’ve tried, for warmth. But they’re not my ‘go to’ photography gloves, because I need something that allows a little more dexterity. These are great for backcountry travel, for skiing or snowboarding, etc. But for photography, they’re not ideal – too clumsy for me. I have a pair of Outdoor Research Alti Mitts, and they’re great; very warm, as warm as any I’ve tried. Under that I wear a liner gloves, either a really lightweight fleece liner, or a heavier one like OR’s PL 400 series. What I don’t want is some liner gloves that are too tight. A little large is good. The fleece Mountain Hardwear Monkey gloves are great, too. Some of my friends here in Alaska go with fur; a sealskin hat, beaver mitts, or a caribou-skin boots. Nothing is warmer. I’ve also started using those chemical hand warmer packs, like HeatMax Hot Hands. I keep those inside my mitts; when I remove the mitts to fiddle and futz with the camera, not only do my hands get cold (“cold” doesn’t really describe it – ungodly frozen, like, so cold they’re on fire is closer), but the mitts lose the warmth inside them. So sticking my frozen fingers back inside those now cold mitts isn’t enough; they just don’t warm back up. I just have cold hands and cold mitts at that point. Hands are definitely the hardest part of this stuff, imo. Our hands are a pretty strong argument that we did not evolve in the subarctic, but somewhere warm and comfortable; fingers are not real functional at 30 below. Keeping fingers warm, yet using them, is a difficult task. Keeping warm isn’t too hard if they’re buried inside a big heavy insulated mitten. I’ve never been able to operate my camera when I’m wearing mittens, so I remove them, and my fingers hate me for it. So the last thing I’ll mention about clothing here is a quick point about durability. I’m amazed, every winter, at how quickly and easily just about anything breaks, and that includes clothing. Jackets rip, gloves tear, and seams split oh-so-easily; when it’s cold like this, anything you touch will be way less forgiving than it might normally be, and the materials of your clothing will be similarly so. That being the cast, durability matters. Don’t skimp and buy some lighterweight ultralite fabric because it’s color catches your eye. Get some hardy, robust gear because it WILL tear open. When all else fails, move. Blood flow is your best bet; everything else here is an insulative process, materials designed to best keep the heat your body generates against your body. The flip-side of that is to generate more warmth. For my toes, it means walking. Hike around. Climb – climb up the nearest small hillside, and you’ll warm up; few things heat us up like going uphill. Don’t overdo it, and raise a sweat; that’ll do you more bad than good. Pay attention to your body, and be careful. But move. For your fingers, swing your arms; back and forth, not high, and front to back to front. 2-5 minutes; or even longer if need be. Don’t raise your hands above your heart, but swing your arms, with some vigor. Your fingers will thank you. Yep, trying to shoot some landscape images, and the cable release in my hand, much like my beard, is frozen solid. Gently does it! Click on the image to see a larger version (and the frozen cable release) of this photo. Just as important; stay well fed. Heat is energy, and energy, for your body, = calories. Stay well fed. Eat a chocolate bar. Eat a bagel. Eat another chocolate bar (make sure you keep these items NOT in an outside pocket, or on the hood of your car, if you don’t want to chip a tooth). Stay hydrated. And don’t “hold it in”; if all that hot chocolate and coffee needs to be released, take the 23 minutes it requires to undo the 13 zippers and remove enough clothes to make it happen, and relieve yourself. Your body is wasting precious energy keeping all that fluid warm, and that fluid is sucking up warmth your body needs. Get rid of it. Another option, sometimes, is to scurry back and forth between your vehicle or nearby shelter (house, motel, cabin, whatever); it’s actually pretty easy to stand around in the cold for too long, and not realize how much body heat you’ve lost, then all of a sudden hit a wall and not be able to catch back up. So, if the option is available and workable, head back inside for a 10 minute spell and stand by the fire. Then head back outside. Better to be warm and OK, and miss a photo or 2 than freeze your junk off. And remember to stack the cabin firewood box when you leave. NB: If you choose this last option, back and forth between a warm motel room and the cold outside, do NOT bring your camera inside. Leave it set up on your tripod beside the car, or on the porch. Bringing a warm camera inside a toasty warm cabin is a good way to toast your gear; condensation isn’t electronics friendly. If you must bring it inside, stick it inside a zip lock bag, and insulate the camera inside your puffy jacket, or leave on the floor in the corner where the cabin is coldest. And overnight, toss in a Dry Pack Moisture Absorbing Silica Gel packet to help keep it dry. This article isn’t really a “Camera Tips” offering, so maybe I’ll write another edition for dealing with your camera gear. One last item: realize how much longer you will take dressing up to head out, and dressing down when you come back inside, than you usually do; cold weather winter photography isn’t something you’ll do well with if you have to hurry. For example, if you’re the type who likes to sleep til the last minute, then race out to shoot as sunrise lights up the sky, you’ll more than likely miss most of your shooting opportunity. All those layers and loft and puffy down and loose-fitting accoutrements will take way longer than you think they will to comfortably and properly adorn your body. So plan accordingly. Realise though winter sunrise here might be 10:00am, so you should be just fine. PS: I get quite a few emails with questions about this topic, so if you have any questions, please feel free to post them below and I’ll respond here for you below. Thanks. Wanna see more like this? Epic tales, rants and insights - hardly "just another weblog"! Welcome to the Expeditions Alaska blog. You'll find photos, videos and articles relevant to backpacking in Alaska. Enjoy it! Receive the blog posts via email. Why would ya wanna miss one? This is where it all happens. Keep yourself up to date and receive access to trip discounts, gear info packets and photo eBooks. Right here. Enjoy these 2 free downloads. 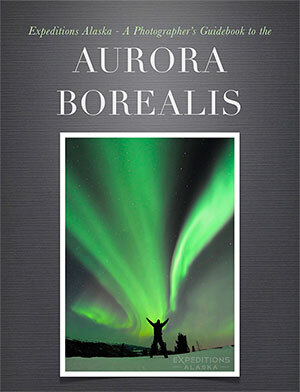 A photographers guidebook on how to shoot the northern lights. ... and we'll love ya right back.